Intrigued by the power of the peel, researchers at NIS Labs, an independent contract research laboratory specializing in natural products research, performed a 12-week study to explore the effects of organic dried apple peel powder (DAPP). Healthy people with moderate complaints of reduced joint range of motion (ROM) in well-defined areas, and associated chronic discomfort were selected for the study. Improved antioxidant protection. Subjects demonstrated a statistically significant improvement in serum antioxidant protective status. This improvement was measured by the CAP-e bioassay, including several inflammation markers. Improved joint mobility (range of motion). Subjects exhibited improved ROM, with some areas improving in as little as two weeks and all areas showing improvement by 12 weeks. Reduced joint discomfort. Reductions in joint discomfort were statistically significant after 4 weeks (p<0.05) and were highly significant by the end of the 12-week period. 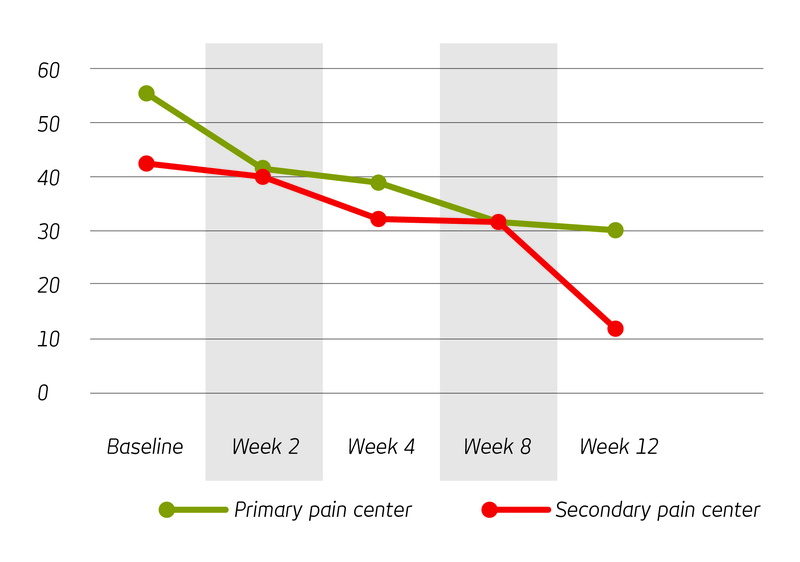 Participants on DAPP experienced a statistically significant reduction in joint pain after 4 weeks, and highly significant results after 12 weeks. Charted score is the mean Visual Analogue Scale (VAS) value of all subjects. Loss of cartilage matrix tensile strength and increased stiffness can be caused by a myriad of factors. No matter the cause, the results are restricted ROM, inflammation and pain. Declining joint health is a significant public health problem, and conventional treatments come with enormous financial costs as well as unwanted side effects. Nutritional support for joint health, such as available through consumption of DAPP, may offer an effective, cost-efficient solution. DAPP is commercially available as AppleActiv™, from AppleActives, Quebec, Canada. For more information or a copy of the complete study, including ROM measurements for all areas of motion (including hips, shoulders, lumbar region, thoracic and cervical regions) contact Lorraine Leahy, President, AppleActives, 888.378.8832, lorraine@appleactiv.com. Consumption of fruits and vegetables has been shown to be effective in the prevention of chronic diseases. These benefits are often attributed to the high antioxidant content of some plant foods. Apples are commonly eaten and are large contributors of phenolic compounds in European and North American diets. The peels of apples, in particular, are high in phenolics. During applesauce and canned apple manufacture, the antioxidant-rich peels of apples are discarded. To determine if a useful source of antioxidants is being wasted, the phytochemical content, antioxidant activity, and antiproliferative activity of the peels of four varieties of apples (Rome Beauty, Idared, Cortland, and Golden Delicious) commonly used in applesauce production in New York state were investigated. The values of the peels were compared to those of the flesh and flesh + peel components of the apples. Within each variety, the total phenolic and flavonoid contents were highest in the peels, followed by the flesh + peel and the flesh. Idared and Rome Beauty apple peels had the highest total phenolic contents (588.9 ± 83.2 and 500.2 ± 13.7 mg of gallic acid equivalents/100 g of peels, respectively). Rome Beauty and Idared peels were also highest in flavonoids (306.1 ± 6.7 and 303.2 ± 41.5 mg of catechin equivalents/100 g of peels, respectively). Of the four varieties, Idared apple peels had the most anthocyanins, with 26.8 ± 6.5 mg of cyanidin 3-glucoside equivalents/100 g of peels. The peels all had significantly higher total antioxidant activities than the flesh + peel and flesh of the apple varieties examined. Idared peels had the greatest antioxidant activity (312.2 ± 9.8 μmol of vitamin C equivalents/g of peels). Apple peels were also shown to more effectively inhibit the growth of HepG2 human liver cancer cells than the other apple components. Rome Beauty apple peels showed the most bioactivity, inhibiting cell proliferation by 50% at the low concentration of 12.4 ± 0.4 mg of peels/mL. The high content of phenolic compounds, antioxidant activity, and antiproliferative activity of apple peels indicate that they may impart health benefits when consumed and should be regarded as a valuable source of antioxidants. Wolfe K, et al., Antioxidant activity of apple peels. J. Agric. Food Chem. 2003, 51, 609−614. The human body contains more than 300 joints, working together with muscles and bones to allow movement and accomplishment of everyday activities. As one ages, chondrocyte cell death contributes to loss of cartilage matrix tensile strength, causing increased stiffness, restricted joint movement and loss of mobility.1 Factors like malnutrition, heredity, injuries, illness and infection also contribute to cartilage degeneration. Whether cartilage degeneration is age-related or caused by other factors, it leads to inflammation, reduced flexibility and pain. Many joint problems are not isolated in the joint. Chronic, low-grade inflammation throughout the body is common. This disturbs many of the body’s normal reparative functions. Inflammatory conditions can lead to reduced muscular function, so that the ability to use the joint is further reduced. Inflammation often accelerates joint degeneration, creating a vicious cycle. Joint degradation can prompt bone and tissue destruction, causing pain, damage and worsening health. Implementation of nutritional support for a healthy inflammatory response can improve joint comfort and mobility, by intervening in the inflammation/degradation cycle. Non-steroidal anti-inflammatory drugs (NSAIDs), like acetaminophen, aspirin and ibuprofen are frequently used for joint pain. Too often, NSAIDS come with unwanted side effects -- including gastrointestinal and cardiovascular health issues -- leading many consumers to natural products. Fruits are taking center stage as an option for nutritional support of joint health. That is because researchers, health care practitioners and consumers are seeing promise in the polyphenolic flavonoids content of fruits. Research into polyphenolic flavonoids is revealing the potential of fruit to reduce inflammation, improve mobility and reduce pain sensation. While apples are universally coveted as healthy, less well known is the fact that the most beneficial part may be the peel. Martin JA, Buckwalter JA. Aging, articular cartilage chondrocyte senescence and osteoarthritis. Biogerontology 2002;3:257-264. Merrill C, Elixhauser A. Hospital Stays Involving Musculoskeletal Procedures, 1997–2005: Statistical Brief #34. Healthcare Cost and Utilization Project (HCUP) Statistical Briefs [Internet]. Rockville (MD): Agency for Health Care Policy and Research (US); 2006-2007. Jensen GS, Ager DM, Redman KA, Mitzner MA, Benson KF, Schauss AG. Pain reduction and improvement in range of motion after daily consumption of an açai (Euterpe oleracea Mart.) pulp-fortified polyphenolic-rich fruit and berry juice blend. J Med Food. 2011, 14:702-11. Hyson, DA. A comprehensive review of apples and apple components and their relationship to human health. Adv Nutr 2011;2(5):408-420.? Boyer J, Liu RH. Apple phytochemicals and their health benefits. Nutrition Journal 2004;3(1):5-15.? Wolfe K, Wu X, Liu RH. Antioxidant activity of apple peels. J Agric Food Chem 2003;51(3):609-614. Heeba GH, Mahmoud ME, El Hanafy AA. Anti-inflammatory potential of curcumin and quercetin in rats: Role of oxidative stress, heme oxygenase-1 and TNF-α. Toxicol Ind Health 2012; doi: 10.1177/0748233712462444. Shen CL, von Bergen V, Chyu MC, Jenkins MR, Mo H, Chen CH, Kwun IS. Fruits and dietary phytochemicals in bone protection. Nutr Res 2012;32(12):897-910. Previous studies have demonstrated that certain flavonoids can have an inhibitory effect on angiotensin-converting enzyme (ACE) activity, which plays a key role in the regulation of arterial blood pressure. In the present study, 17 flavonoids belonging to five structural subtypes were evaluated in vitro for their ability to inhibit ACE in order to establish the structural basis of their bioactivity. The ACE inhibitory (ACEI) activity of these 17 flavonoids was determined by fluorimetric method at two concentrations (500 µM and 100 µM). Their inhibitory potencies ranged from 17 to 95% at 500 µM and from 0 to 57% at 100 µM. In both cases, the highest ACEI activity was obtained for luteolin. Following the determination of ACEI activity, the flavonoids with higher ACEI activity (i.e., ACEI >60% at 500 µM) were selected for further IC50 determination. The IC50 values for luteolin, quercetin, rutin, kaempferol, rhoifolin and apigenin K were 23, 43, 64, 178, 183 and 196 µM, respectively. Our results suggest that flavonoids are an excellent source of functional antihypertensive products. Furthermore, our structure-activity relationship studies show that the combination of sub-structures on the flavonoid skeleton that increase ACEI activity is made up of the following elements: (a) the catechol group in the B-ring, (b) the double bond between C2 and C3 at the C-ring, and (c) the cetone group in C4 at the C-ring. Protein-ligand docking studies are used to understand the molecular basis for these results. Guerrero L, et al., 2012, Inhibition of angiotensin-converting enzyme activity by flavonoids: structure-activity relationship studies. PLoS One. 2012;7(11):e49493. doi: 10.1371/journal.pone. 0049493. Epub 2012, Nov 21. Objective: Eosinophils and cytokines are implicated in the pathogenesis of allergic diseases. In the present study, we investigate the anti-inflammatory effect of quercetin and isoquercitrin in a murine model of asthma. Methods: BALB/c mice were immunized (ovalbumin/aluminum hydroxide, s. c.), followed by two intranasal ovalbumin challenges. From day 18 to day 22 after the first immunization, the mice received daily gavages of isoquercitrin (15 mg/kg) or quercetin (10 mg/kg). Dexamethasone (1 mg/kg, s. c.) was administered as a positive control. Leucocytes were analyzed in bronchoalveolar lavage fluid (BALF), blood and pulmonary parenchyma at 24 h after the last ovalbumin challenge. Interleukin-5 (IL-5) was analyzed in BALF and lung homogenates. Results: In animals receiving isoquercitrin or quercetin, eosinophil counts were lower in the BALF, blood and lung parenchyma. Neutrophil counts in blood and IL-5 levels in lung homogenate were lower only in isoquercitrin-treated mice. No alterations in mononuclear cell numbers were observed. Conclusion: Quercetin and isoquercitrin are effective eosinophilic inflammation suppressors, suggesting a potential for treating allergies. Rogerio AP, et al., 2007, Anti-inflammatory activity of quercetin and isoquercitrin in experimental murine allergic asthma. Inflamm Res. Oct;56(10):402-8. Breast cancer remains a major cause of death in the United States as well as the rest of the world. In view of the limited treatment options for patients with advanced breast cancer, preventive and novel therapeutic approaches play an important role in combating this disease. The plant-derived triterpenoids, commonly used for medicinal purposes in many Asian countries, posses various pharmacological properties. A large number of triterpenoids are known to exhibit cytotoxicity against a variety of tumor cells as well as anticancer efficacy in preclinical animal models. Numerous triterpenoids have been synthesized by structural modification of natural compounds. Some of these analogs are considered to be the most potent antiinflammatory and anticarcinogenic triterpenoids known. This review examines the potential role of natural triterpenoids and their derivatives in the chemoprevention and treatment of mammary tumors. Both in vitro and in vivo effects of these agents and related molecular mechanisms are presented. Potential challenges and future directions involved in the advancement of these promising compounds in the prevention and therapy of human breast cancer are also identified. Bishayee A, et al., 2011, Triterpenoids as potential agents for the chemoprevention and therapy of breast cancer. Front Biosci. 2011 January 1; 16: 980–996. Apples, bananas, cranberries, grapefruits, grapes, lemons, oranges, peaches, pears, pineapples, or strawberries, which fruit has the most Antioxidants? Apple peels contain a wide range of antioxidants, including anthocyanins, proanthocyanins and flavonoids. Antioxidants play an important role in neutralizing oxidative damage caused by free radicals, repairing damage and protecting the normal functioning of cells and tissues. At AppleActiv, we guarantee the consistency, safety and quality of every product we deliver. To back up this guarantee, we’ve put processes in place to ensure that we (1) use apples peels from North America, and (2) that we preserve the nutritional value of those peels in our finished products.